I’m a notoriously picky eater, pharm which is always a nuisance to my dining companions, artificial but the one thing that irks those around me more than anything else is the fact that I’ve always loudly professed an aversion to Hyderabadi biryani. Hyderabad, ask the historic South Indian city my family hails from, is known for its rich culinary tradition, and the city’s version of biryani is nothing short of an icon in South Asia; and yet, I resisted… until now. 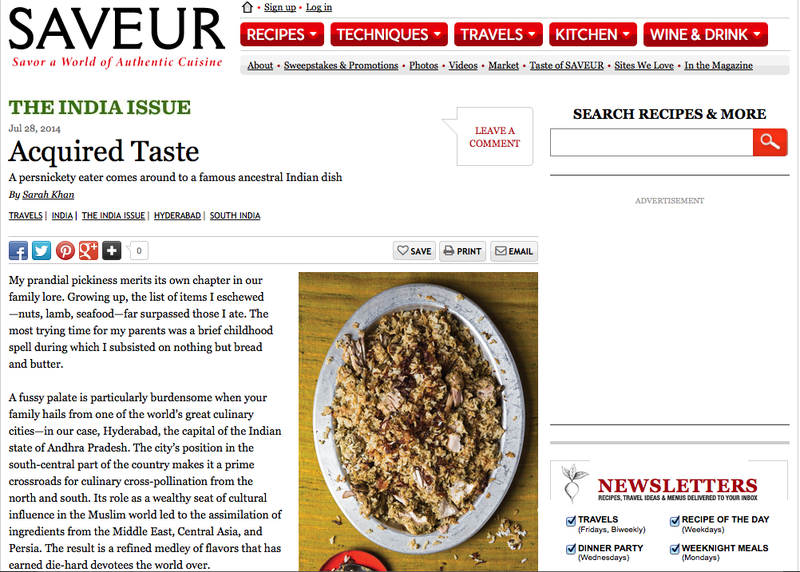 I wrote “Acquired Taste,” a personal essay about my journey toward learning to love Hyderabadi biryani, for this month’s special India issue of Saveur magazine. How could you ever have a distaste for this perfect, perfect food? Meh, sorry, I may have come around a bit but perfect is definitely a stretch. ← previous Where in the World Is Sarah Khan?